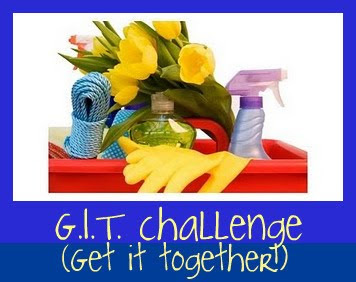 The idea of a GIT Challenge is to play catch up with whatever we need to get done. 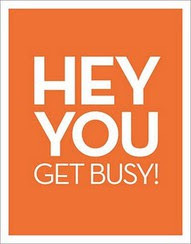 Just leave a comment saying you’ll play along, minimize this post so you can easily come back to it throughout the day, stop what you are doing (meaning get off the computer and stop procrastinating! ), take an hour right now to catch up on things you need to do and work as fast as you can! Come back every hour or two and leave a comment with your progress. Check out what other participants have accomplished – all in the comment section, no blog hopping necessary. After updating, get back to work for another hour or so until you’re done for the day. We always accomplish so much during these challenges! Jump in anytime, there’s no special time to start or finish. It’s fun working together – join us! IT’S TIME TO GET AGAIN! I used to do a Saturday post over at THE Motivation Station and thought it would be fun to start it up over here. If there is no rhyme or reason why something happens, there is no obvious explanation for it without any reasonable explanation or purpose. 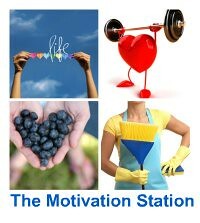 Over at THE Motivation Station we are all striving to find the motivation to get our lives, families, jobs, clutter, homes, etc… under control. One of the things I have learned personally, is that despite our best intentions, life sometimes creeps up on us and hits over the head no matter how prepared and in control we think we are, just to show us that we are NOT in complete control! While I’m still dealing with the BIG C, one of my inspirations is this qoute by Erma Bombeck. Please remember to enjoy your life, your family and all you have – the power of positive thought can work. By taking care of yourself first, you can be there for your family and friends when they need you. But mostly, given another shot at life, I would seize every minute. Look at it and really see it. Live it and never give it back. 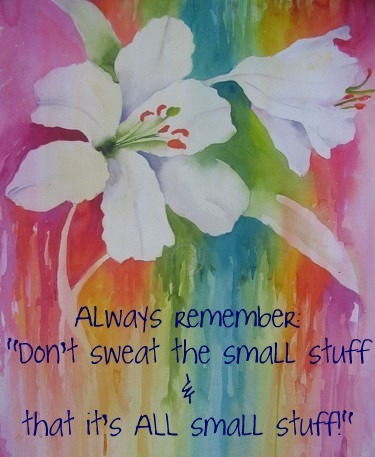 STOP SWEATING THE SMALL STUFF! Come over and join us at THE Motivation Station to participate, be a new author and/or offer you thoughts and suggestions to living a motivated life. See you there. Last Monday Martha got us thinking about serious spring commitments over at THE MOTIVATION STATION and I wanted to expound on that theme with a little background of the season and the holidays within it and a great recipe to finish off the indulgences before our fast/lent begins. You don’t have to be religious or Catholic to join us. In the southern United States, the tradition was brought to the area by colonists from France and Spain and it is associated with Carnival, which is celebrated in the Gulf Coast region, centered on New Orleans, but ranging from the Florida Panhandle to East Texas. King cake parties in New Orleans are documented back to the eighteenth century. The king cake of the New Orleans Mardi Gras tradition comes in a number of styles. The most simple, said to be the most traditional, is a ring of twisted bread similar to that used in brioche topped with icing or sugar, usually colored purple, green, and gold (the traditional Carnival colors) with food coloring. Cajun king cakes are traditionally deep-fat-fried as a doughnut would be, and there are many variants, some with a filling, the most common being cream cheese and praline. It has become customary in the New Orleans culture that whoever finds the trinket must provide the next king cake or host the next Mardi Gras party. The cake is then baked, and decorated when it comes out. The classic decoration is simple granulated sugar, colored purple, green, and gold (the colors of Carnival). King cakes have gotten more and more fancy over the years, so now bakeries offer iced versions (where there’s classic white coffee cake glaze on the cake), and even king cakes filled with apple, cherry, cream cheese, or other kinds of coffee-cake fillings. King Cake is traditionally served with chicory coffee’ as Coffee’ au lat’. It is best eaten warm and if you must break tradition, it can be eaten with ice cream, preferably chocolate. Mardi Gras is French for “Fat Tuesday” (in ethnic English tradition, Shrove Tuesday), referring to the practice of the last night of eating richer, fatty foods before the ritual fasting of the Lenten season, which started on Ash Wednesday. Related popular practices were associated with celebrations before the fasting and religious obligations associated with the penitential season of Lent. Popular practices included wearing masks and costumes, overturning social conventions, dancing, sports competitions, parades, etc. Similar expressions to Mardi Gras appear in other European languages sharing the Christian tradition. In English, the day is called Shrove Tuesday, associated with the religious requirement for confession before Lent begins. 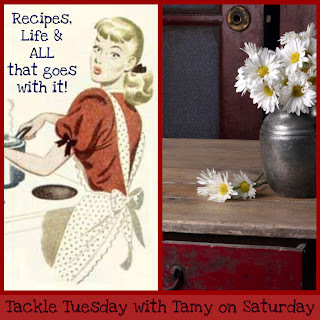 Join us at The Motivation Station for some fun, encouragement and a few recipes too!